We are planting our garden in stages this year.......since my energy has not been at its peak, we started with strawberries, cucumbers, cabbage and potatoes......moving into the next couple of days, tomatoes, squash, peas and peppers. I love growing our own food. Not only does it taste better, we don't use any funky chemicals or pesticides. You can pick something off the vine and eat it. Do you know how good a homegrown tomato tastes? How sweet a peach or apple or pear is that is picked straight from the tree? Jordan has already requested a blueberry pie, so you know what I will be doing this week.....the blueberries are so yummy right now. This morning after our walk, we just walked over and ate a handful of warm ripe blueberries off the bush.....WOW! Sometimes it is difficult, the drive to the nearest town......you do have to plan.....and as the price of gas inches upward, you have to include several errands in one trip. But this living out in the country......well the good outweighs the bad. Our niece Samantha brought her boyfriend by for Sunday lunch over the weekend.......all he could do was walk around and say "I love this place". It is a little piece of heaven on this great big earth. Once again, I will say.....I am a lucky woman. A day of rest, that is what this day has been......a beautiful day of sunny warm weather, blue skies, and peaceful rest. Rest, when I was younger, I thought it was such a waste of time....and one of my mom's favorite sayings "you can rest when you die". I believed her words for such a long time.....but not anymore. I love life, I love what I do, I love my friends and family and I have learned to really experience the best that life has to offer.......being healthy is vital. For my good health......rest is essential. For my voice to be at its best, to feel good, to fight infections and to teach yoga.......I have to rest. I understand the importance of rest......for the mind, the spirit and the body......for healing.....for peace......for joy. Honestly, I am beginning to enjoy my rest......an afternoon nap.....sitting on the porch.....hugging Blackie Bear......Rest is good! I still push and often I push too hard, but that is not bad either, not as long as I find the time to rest. If you are like I once was, if you scoff at rest, at naps, at any speed other than full........it is time to find balance. A siesta, a few minutes with a great book or just sitting still and breathing.....you'll be amazed at how much more you accomplish, how much more focused you can be. Fatigue is more than just not being 100%, it is a warning that the body needs a break.....and sooner or later it will take it.......usually because of illness. Rest......it is a four letter word, but one of the good ones. Just start with small five minute breaks, if you make a habit of five minutes a day......your body, your mind and your spirit will thank you......and soon who knows......you might even take a nap! So, here I am at Local Color Last night before the show started. My friend Becky bought me the cool purple shirt for my birthday. 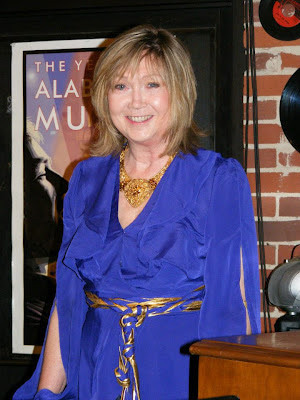 (she knows purple is my favorite color) and the necklace is one of my vintage pieces. We were getting ready for the sound check, and my friend Diana shot the photo. It was one of those magical nights......when the music gods smile on you. The venue is quite unique, art gallery, restaurant and music venue......a full house of music loving folks, sharing a stage with some of the best songwriters in Alabama......sometimes I have to just pinch myself......I am one lucky woman. It has been a tough week, extremely busy and the lung infection just won't let go. But this week, there is another treatment and some time off work. Tomorrow is a rest day. Jordan will pick blueberries with us, we'll eat popcicles and blow bubbles.....and once again, I will count my blessings. Don't forget to count yours. A year ago today, our state, was torn apart by tornadoes.....today the sun was shinning. We played with a couple of our song writer buds tonight, a great venue, good crowd and a good time was had by all. What a difference a year makes.......today, the birds were singing, the skies were blue. 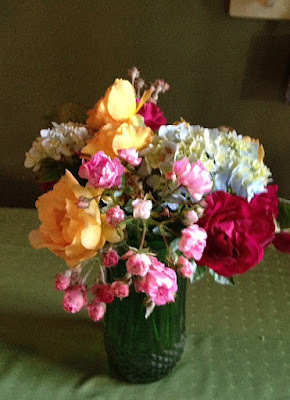 And just for all of you, I offer an arm full of flowers from my brother's garden. Beauty and gratitude, music and fun.......what a difference a year makes. Many of our areas still look like war zones......but what a difference a year makes. None of us who lived here will ever forget April 27, 2011.......but what a difference a year makes. texts and emails, a new cd, a tin of fresh exotic tea, prayers......simple pleasures......all within the past twenty-four hours. I often do a rose meditation in yoga class. I speak of placing a tiny rose bud on your chest, and with each breath you take, the bud unfurls......soft velvety petals......each petal represents someone who loves you, someone who cares........by the time all the petals unfurl.......a beautiful fragrant rose rests on your chest. 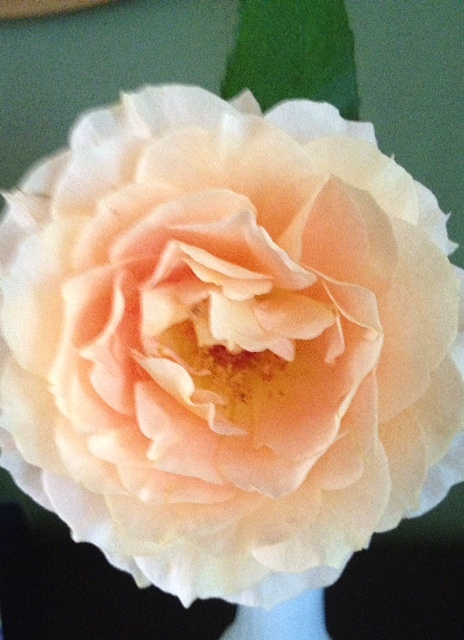 This is another one of my brother Ricky's beautiful roses. I truly believe tonight each of those petals represent someone in all of our lives who loves and cares for us. Letting go is something that I talk about in yoga all the time. Letting go of stress, of worry, of fear, of expectations......letting go is difficult. My life is changing and I know there is a cross roads in my future and major decisions to be made. Letting go of what you love, letting go of a part of who you are......is most frightening. Change is exhilarating, yet terrifying. When the time comes to let go......you have to take the leap of faith. It can't be a timid step or even a jump......it has to be a leap. Right now, I am holding for dear life, because the leap scares me to death........but I can assure you, one morning.....I will take a deep breath......and I will leap. If you are standing at the cross roads too, just remember......no baby steps, no jump......you have to leap! May all our leaps lead to the life we dream of, the place we long for. it took your breath......I thought I was back in Colorado.....it was wonderful, no humidity. I miss the West, once treatments are done, I know I will spend some time in the desert and then maybe a few days in those Rockies. What is it about particular places that speak to us so strongly? That pull, that need to be in a place? All I know, there are times there is an ache in my heart for certain places. Sometimes, it's the desert, the spaciousness, the bareness, the feel of being in another world......then those moments when I crave a "Rocky Mountain High"......and those nights when I am so homesick for Ireland, I cry on my pillow. It is strange to have such strong feelings for places, as though they were family or long lost friends......but I do. I think at times, some ancient ancestors must have been nomads, I get the urge to wander, the need to move, to see and experience places other than home. For fleeting moments today, I could close my eyes and imagine that I was someplace else. that urge to go, to wander was strong, tugging at my heart, whispering promises of places where my soul belongs. Down the slippery slope, it started last weekend.....that little lung infection that is always hanging around decided to throw a party and invite some more bacteria.....but, I saw the doc, got meds on Tuesday and things were looking up. we had a great time and really seemed to connect with a lot of the kids. The slippery slope......it was outdoors for almost four hours......chilly, damp, the air loaded with pollen. Performing, no matter where or who is in the audience is hard work, singing requires a great deal of energy and the speaking can be draining. Probably even all of the above would have been ok, but then we drove home, I changed clothes, and went directly to work. Three hours of very emotional yoga. A few hours of sleep, up at 5:00am on Saturday morning for a four hour drive south, .......and now you all know why I can speak first hand on how it is so easy not to take care of yourself. But a good visit with friends and home, warm and peaceful tonight......and soon about to climb into my bed. I am like so many of you, driven.......by love, by creative energy, by need, and by fear. care......is a very very hard thing for me to do. I know how to give, and I do it well, but honestly......receiving is quite difficult for me. Some days brain fog rolls in.....and does not leave......so it is today. I have pushed way too hard, and my body is screaming obscene things at me tonight. The lungs demand rest, they are tired,and are not very concerned with my need to breathe. I hope you all have had a grand and glorious Saturday, may your Sunday be the perfect end to a happy weekend. dealing with my disease......what can I say.......I have just been living like all of you the past two years. I never expected to still be blogging......but it has been such a wonderful gift for me. Sharing words and feelings, sometimes a photo.....making it through the good and the bad, just like everyone else every day. My heart is full of gratitude that I am able to share my thoughts on yoga, music, and life with each of you. I thank you for reading my words, for sending comfort and kindness when I needed it. I hope in some small way, I have helped you. I hope in some way, I have touched your heart, and maybe encouraged you to look at life a little differently. I hope that your day has been a little brighter because of something I said and maybe on days when your glass was half empty, it became a little fuller. I hope that you see the beauty in some of the things I see, that you see the good that I see all around us, I hope you think of yoga in a different light, and that every once in awhile, you think about walking barefoot. I hope you have given more hugs, smelled more flowers, and gazed in wonder (and howled) at the full moon. I hope you have taken more breaths, and spent more moments in silence. I hope you have been kinder to yourself, more loving to your body. I hope you have smelled honeysuckle, gardenias and peonies......and eaten a fresh tomato. I hope you have felt warm breezes and gentle rain......I hope you know that I wish and hope only good things for all of you. Thanks for reading my blog. A good day today, even though I am still dealing with infection, my friend Kaye and I got facials and make-up at our local Lancome counter. It is always so nice to have someone do something so soothing like a facial and make-up......and the end result is wonderful. Spirits are lifted, you look better and feel better......and time with friends.....it just doesn't get much better than that. I have really made an effort to spend a little more time on myself these past few months, and it helps. Even when the infections hit, and I feel so lousy, the pedicures, hair cuts and facials make a difference in my outlook. Rick says fly fishing does the same thing for him! I think we all need those moments that take us out of our ordinary day. When we don't think about work, or what needs to be done, or when we have to take the next round of meds. For most of us, our lives are made of ordinary days, with extraordinary moments that come and go way too quickly. I'm sure our make-up artist, Brian didn't realize what a difference he made in my day....for him, it was probably just another day at work, for me........I walked in feeling lousy.....and left feeling on top of the world......time with my friend and a little paint on the face......a great way to spend the afternoon. "It is funny about life; if you refuse to accept anything but the best, you very often get it." I have always tried to live by this quote.....or rather simply, I just try to always expect the best. For instance, my very first trip to NYC, all my friends at home and there warned.......anyone as nice and easy going as you will be eaten alive. First day, there I did what I was told not to do, I asked a newspaper vendor for change......he was quite taken aback when I asked.....at first he was speechless, then he laughed and told me that my southern accent was so wonderful that if I stood there and talked to him, he'd give me anything. My third day in the city, I needed to cash a check on my hometown bank.....of course I walked into Chase Manhattan first thing as they opened. The woman behind the counter seemed taken aback also, but her phone rang, and after she spoke to the person that had called she asked the guard to to take me upstairs. ( I was a little nervous, but I followed). The guard led me to the VP's office, on the upteent floor, seems he had seen the security tape and had made the call to the teller, he asked where I was from, why I was in town, how long I would be there.......then told me they would gladly cash my check and would be there to help me with anything they could while I was in the city. I have dozens of stories like these from cities and towns all across this county to villages in Ireland. Our first day in Ireland, we got lost, it was late afternoon, we had not had lunch and had driven for miles on the wrong side of the road......we stopped at a gas station, asking directions, of course the woman asked where we were from, why we were there. I also asked about a place to eat, explaining that we had missed lunch.....she went to the back of the store, came back in a few minutes with sandwiches and a smile, telling us to enjoy our stay. Often when things seem to be at their darkest, I have to remind myself to expect the best.....and if the worst happens.....I try to find some good somewhere......it is always there. I have struggled mentally for the past few days with my illness......I thought I suppose, that the treatments would just magically keep me from ever being sick again ( I know, I have only had two, it's those rose color glasses I wear.) I finally convinced my self today, it could all be much worse......the best is just around the corner. I am just a big ol whinny baby tonight. It is rainy and cold, and I am in the midst of a pity party. It will all be better tomorrow.....tonight, I wallow. He is a rock star! I personally saw his head swell at least two sizes! About to take the meds, and find the bed. 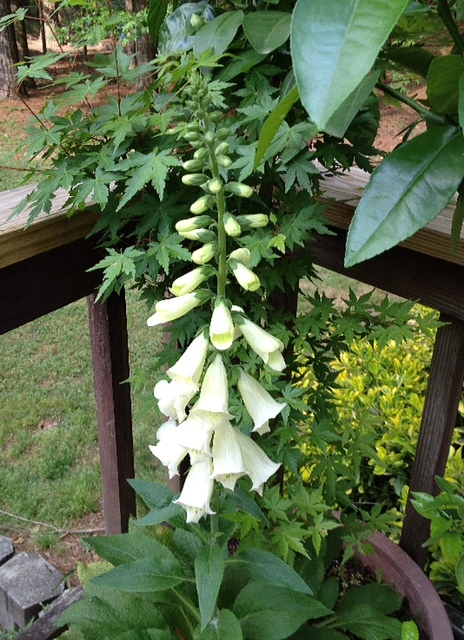 Foxgloves are one of my favorite garden flowers. This one "volunteered" in the pot with the Japanese maple. I love it when the unexpected happens in the garden! Today has been one of those "do what you love days".........we spent the afternoon at our friend and sound man extraordinaire Fred's house recording a couple of our songs. Fred makes us sound the way we dreamed of sounding.......and our goal......by end of summer or early fall to finally have our singer/songwriter cd completed. Being sick for almost a year has delayed our recording, but my energy and strength and breath are finally coming back.......I am reborn. I am still having to pace myself.....like a nice long nap before the session today......and probably will have to continue that for sometime.....but it's ok. To "do what I love" is more than I deserve.......to "do what I love" is a the greatest gift I can be given. To "do what I love".....teaching yoga, and sharing our music is my life.....and I am blessed. I hope you all have experience a "do what you love" week. I have friends who are anorexic, bulimic and obese.......they struggle so hard with their "self-image." I understand body image......I was a chubby fat child. My nick-name at one time was tug-boat.....when I was nine, I weighed more than my sister who was in high school. Then, a couple of years later, I got sick.....and I was the skinny girl.......really skinny, at one point in high school......76 pounds. I've heard the fat jokes and the skinny ones. Self-love is the mirror that shows our true self. and self-hatred seems to be an epidemic in the female population. We have bought the lie, sold to us by Madison Ave, by movies, and tv shows and magazines.......we believe that fairy tale of perfection. Not only do we practice self-hate, but there seems to be a rampant growth of mis-trust among females. I am astounded by how often I hear women brag about only having male friends, of not trusting other women. How sad is that? Not to have a female friend to spend time with, to talk to......don't kid yourself......men are wonderful.....but none of them will ever understand, bloat, chocolate, shoes or hot flashes! I think self-love is the only way to happiness, the only way to find love, the only way to survive. Jenny Craig was probably right about self-love being a weight loss aid.......the truth is when you love yourself......you want to be healthy......and as the years go by.....healthy becomes way more important, than thin, beautiful.......or perfect. We are going to call it a night, get some rest, and think of something clever to write tomorrow night. I was off today, and did not have a doctor's appointment, yes! I really had not made plans, it was going to be a fly by the seat of my pants kind of day. The phone rang about a quarter after six this morning, it was my brother Ricky (Jordan's grandfather) he asked if Jordan could spend the day. Seems Jordan had told him last night before he went to sleep that he wanted to spend the day with Jilda and Aunt Rick. I was a happy camper, any day with Jordan is good. Around eight thirty Jordan and his mom Sam, knocked on our door. Seems he had gotten a boo boo, he was so excited to come to our house, he stepped on a toy and cut his foot. He is still a little freaked about boo boos, so I told him it would be a team effort, and I would need his help. He washed his foot, felt of the antibiotic ointment, let me put it on the cut, and then assisted me with the band aide. ........all was well with the foot. Any day with Jordan is an un-planned day. He is the king of fly by the seat of your pants! We spent time at the barn, we walked, we ran with the dogs. He ate the first ripe strawberry of the season, we checked out the blueberries, apples, peaches, and potatoes and determined when we would feast on all the produce. We painted, wild and wacky and beautiful pictures. We blew bubbles. He helped me water and feed the herbs and flowers. We fed the birds. We cuddled. We talked about his upcoming trip to the beach, and how much fun he would have, and how sad for me that I wasn't going. We had a great day. We ate dark chocolate and played PBS Kids games on the computer. We squished grapes with our fingers and discussed in depth the color and texture of the insides. Un-planned days are gifts. None of us have enough of them......you know the kind of day.....you have a Popsicle for breakfast, finger paint after you take your bath, run with the dogs in your pjs. Un-planned days feed your soul. You forget about yesterday, and no thoughts of tomorrow enter your head. Un-planned days......everyone deserves one. They change perspective, give joy, and teach gratitude......un-planned days.......gifts we all deserve......days we need. We have great neighbors. Every morning when I get up around six they come over for coffee........well they actually come over for a doggie treat. 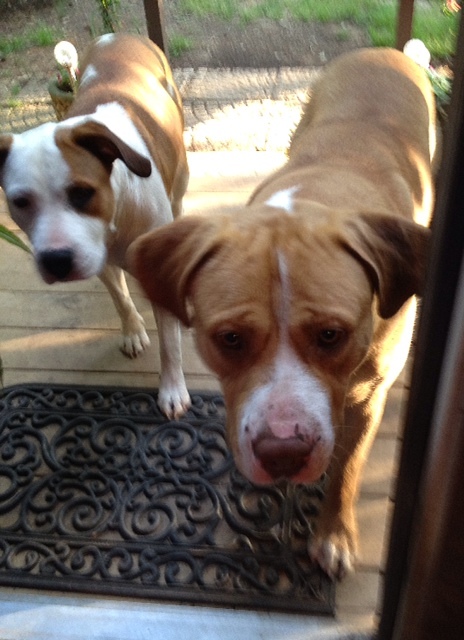 Meet Dixie and Rebel, they are so sweet and so well mannered. As I walk through the greatroom each morning, I see them sitting under the big white pine. I go to the laundry room and get treats, for our dogs as well as Dixie and Rebel to enjoy while we drink coffee. The minute Dixie and Rebel see me (the front of the great room is glass) headed for the front door, they walk up to the porch and politely wait for their treats. Rebel eats his on the porch, Dixie takes hers and sits under the big white pine and munches daintily. walk. They are polite and well mannered and get along so well with our other dogs. It is a delight to see them each morning......and occasionally, they don't make it across the street.....maybe they are busy or have previous engagements. When that happens, I miss them.....somehow the morning just doesn't seem the same without our neighbors visit. Dixie and Rebel......two of the best neighbors, we have ever had. I will share something with you all tonight, for whatever reason I am determined to blog......why do I say this? Because I write on a PC that has gremlins and quite often I may have my whole blog written or partially written and every word is stolen......banished into oblivion with out a trace and no hope of recovery. It has already happened tonight and Rick got to witness it. everything left this universe. It is a mystery, and for me it has become an interesting challenge every night....to see if I can write my blog without it disappearing....and if it does disappear.....what do I do next? Ha,ha! So just to mess with the gremlins tonight, this is it.....my rant about my stolen blogs! Do any of you have this problem? Am I in some weird vortex of blog thievery? Is there a conspiracy? Too many questions, no answers.
" I need this today"......everyday at work, someone walks through my door and says those words. Today, it seemed almost everyone said them. "I need this today"......how can you need yoga? The same way you need water, good food and rest. Yoga gives the body and spirit so much. When you are exhausted or emotionally drained......yoga restores. When you are depressed or angry.....yoga soothes. So many think that yoga is "just" physical exercise, the bending and twisting of the body into funny looking poses. Yoga asanas, (poses) do work the body and depending on the type yoga you do, you can get a great workout. But, then there is the breath work and the meditation and the relaxation......and the combination of the movement, the breath and everything in between is the reason so many say "I need this today". Increasing the flow of oxygen and blood through out the body, using breath and movement will make you feel better. It has been said so many times that yoga heals. I believe that is a true statement.......it calms the mind, soothes the spirit, brings peace.....and when the body is restful, healing can begin.....when the mind is calm, healing can begin....when the spirit is peaceful.....healing of one's life begins. At my community class tonight, several spoke of friends that they had invited to class, but there was always the excuse of "oh, I can't do yoga".......we all laughed......if they only knew how simple, and easy it is to start a yoga practice.....how poses can be modified.....and how much just the breath work does......they would all be saying "I need this today". In my community class there are those with hip and knee replacements, cancer survivors, those with lupus and MS, those with arthritis......all ages, from eighteen to eighty-two. They all find a way to practice "their yoga", "their way". Today, as I was finishing the last class at work, a gentleman walked over to me and said" I knew I needed something today, I just didn't realize that it was this." I know that I teach quite differently, but I know in my heart what yoga can do, and I will teach it to whoever wants it, anyway I can. Because today, we need it. The past few days have been a blur......I sleep so much after treatments.......and the dreams are so vivid. This afternoon as I napped, I dreamed a song......I dreamed I was singing it in front of thousands of people. I did record a little bit of it when I woke up, but I haven't listened to it. Sometimes those songs are great, sometimes they are quite scary outside of dreamland. Ha,ha. I thought of something that I had not thought about in years. When I was three or four years old, (about Jordan's age) my oldest brother Herbert was dating the woman he eventually married, Edith. Edith could play piano, and often after she and Herbert had finished their nightly phone conversation, she would play songs for me......my favorite one that she did.....Easter Parade. I remembered her playing that song today with smiles and tears. My brother Herbert passed away just a couple of months after my mom....so tonight as that memory flooded my head, I thought of my big brother and how I miss him. I almost called Edith and asked if she would play that song for me! cooked all my favorite foods today and one of my most favorite deserts. I think I might explode I have eaten so much! I also thought about my favorite Easter dress.......I was eleven....for the first time in my life my mom bought us matching dresses.....sorta.....hers was black voile, boat neck, fitted at the waist, big full skirt, rows of tiny lace trim......mine was white. She had black hair, olive skin and brown eyes, I have blue eyes, blonde hair, and fair skin......we were opposites in so many ways. Interesting how those dresses showed our differences. Wishing you all a glorious week, filled with all that you love. Tonight, around seven I finally turned the corner on the treatment maladies......I can feel my energy returning, and the aches and lethargy are fading. I made salmon/pasta for dinner and we watched one of my top ten favorite movies.....Chocolat. Yes, Johnny Depp is in it, but this movie is exquisite. The scrip is amusing, interesting, intelligent and the cinematography is breath-taking. Every scene looks like an old master's painting......and then there is the soundtrack......wonderful music! Each time I watch this movie, I want to move to France.....to some remote village and wear red shoes. ( you'll have to watch the movie) But wait, I do have killer red shoes, so all I have to do is move to France......and become the ravishing Juliette Binoche.......maybe in my next life. For now, I can eat wonderful dark chocolate, watch the movie and live out my fantasy in my head. For me, Chocolat is the perfect Easter movie......all about renewal and rebirth.....of people, of a village, and a life of love. No, it is not religious, but it is symbolic of all things spring. And it is full of amazing chocolate! and did I mention Johnny Depp????? So between the incredible moon rise last night, the return of my taste buds and the great salmon for dinner, and one of my most favorite movies.......I think I have survived another treatment......two down, four more to go and then......well, we hope for the best. Here's to rebirth, renewal and resurrection. The universe knows when you need a gift......instead of taking it easy yesterday, I went to work. After the show, I was wiped out....we had planned to eat out, but I looked at Rick and begged to go home. As we were driving down Hwy. 78 East, leaving Jasper, I gasped......at first I thought what a beautiful clever sign......and then it hit me......the full moon! You all know I am infatuated by the full moon, moon struck if you will. This one tonight was one of the most beautiful I have seen in years. A pale soft gold, the color of hay, hanging right over the tree tops shinning down in all its golden splendor. I called Jordan, he loves the moon as much as I do. He was visiting family friends near Montgomery and they have clouds tonight. In a few minutes my phone rang......I could hear his sweet little voice......"it's coming from behind the clouds, I can see it". What a treat to share the moon with him. That moon, that golden orb of shimmer was such a gift tonight. I needed it's beauty, I needed to know that all was right with the universe.....I needed the assurance and gift of a full moon. The full moon is a talisman for me and tonight.....I know, everything is as it should be. I hope you see the beauty, the perfection of that big golden moon......it is a gift to us all. Blackie Bear and I have slept for two days, well not quite.....I did get up, showed up at work and taught my classes. He is soundly sleeping as I write this blog, I can barely keep my eyes open. I am not teaching tomorrow, think I might have pushed just a little too much today. How can something that is supposed to be so good for you, make you feel so out of it????? I have been in a fog all day, most of the words that I have typed tonight.......I typed backwards and had to retype them. A large sea sponge has kidnapped my brain.....sorry, I think I should really find my pjs and then find my bed. I promise, a better blog tomorrow. Today was treatment number two.....wow, it doesn't seem like a month ago that I had the first one. Like before, I have slept most of the day, it will be an early bedtime tonight. There is something about that treatment room, I think for patients it is quite similar to my yoga room for students......my students at work tell me how much they love walking into the room. Many of them talk about how safe, and peaceful it feels. For me the infusion room feels safe and peaceful.....I know that many who are there are very very sick.....but there is a sense of of camaraderie in that soft green room. The sunlight filters through the large windows, you hear the soft footsteps of the nurses. Today, thank goodness the tv wasn't on, and for those of us hooked to our drips we talked......and laughed. It may seem strange to laugh there, but there was joy and laughter and banter. I look out at each person beside me in those big green recliners and I silently say prayers for them.....that for whatever reason those drips are attached.....that the meds do their jobs and healing takes place. moving across the room with grace and love. she is beautiful and funny. I am hoping, I am believing that these treatments, the new mix of meds, and docs, that this is my holy grail. I think I am very blessed......but I want to continue to do my work, and my music for a long time......I have much to share, much to contribute. Rick came in the infusion room with me today. There are chairs for those who come with you to sit in and wait.....and he waits, so patiently. I keep telling him, he can leave and just pick me up later, but he says it is a great opportunity to write.......and today he got to chat with the nurses, and other patients. This path, this part of our journey together, was not planned, but there is good in every experience......and we search it out. like family......God bless them all. I have a green thumb......I can grow all sorts of plants, trees, shrubs, flowers, fruits and vegetables. I cannot grow roses.....but my brother Ricky can. The proof is in this photograph. Ricky is Jordan's grandfather, and yesterday Jordan brought me this beautiful rose. Jordan didn't ask if he could bring me the rose, but it's ok, Ricky laughed. He figured it was a small price to pay for all the popsicles Jordan eats at my house. I love fresh roses from the garden.....not the ones from florists. (sorry, if there are florists reading this) My grandmother Mamie grew roses, big white ones that smelled like heaven....golden yellow ones that looked like sunshine......and pink ones that smelled even better than the white ones. 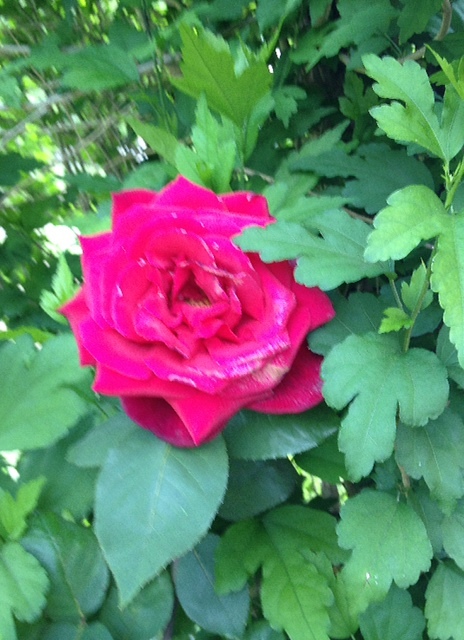 My mom grew roses as well.....she loved red ones. Hers had that deep heady aroma, almost musky, yet sweet. I can grow seven sister roses, I think they may be some sort of tea rose. They are small, clusters of seven miniature roses on a stem, with a sweet spicy smell. I have soft baby pink ones, and rosy pink ones. They are sweet and old-fashioned and are pretty much wild ramblers. Jordan knew he had done something extra special when he gave me the rose yesterday, his eye sparkled, and he laughed as I hugged him. He knows he is loved. Everytime I have looked at that rose today, I have smiled......I know I am loved too. It's already April and the weather here is Alabama feels like June. We had no winter or spring, fall just blew into summer. Already into the fourth month of this year, how can time move so quickly? Some days I think we should do away with clocks and watches, live by the phases of the moon and sun and regain our natural rhythms. My body never wants to wake up when it is still dark outside, it waits for the sun to rise! This is an exciting month for us......gigs every week! Can you see me do my happy dance? Our music is evolving, our songs are growing, it is a good feeling. Playing soon at a location near you......hopefully one day! so well this evening. Actually, we are both kinda huffin and puffin! More rains to come this week, maybe now it is the humidity and the pollen.......the desert calls my name. Our friend Brian and I talked about the desert last night......the spaciousness of it, how it feels as though you are on another planet when you are there, the unique vegetation, the night sky, the energy. It is a good place to go when your batteries need charging. My thoughts are jumping tonight, can you tell? Some nights it is just hard to stick with one thought, this is one of those nights......sorry. A cup of tea, and bed........that will fix it. chef( he use to own a restaurant) dinner was GREAT! Seafood pasta, yummy! and then there was the cake.......deep, dark, chocolate and raspberry liqueur......I think it is the best cake I ever ate. I offered to be their maid if they would let me move in ( and only if Jamie cooked every night). Kaye and Jamie gave me an embroidered vintage table cloth and napkins, it looks like something my grandmother Mamie might have created......just beautiful. Mary and Brian gave ma a really cool yoga book. I love it when my birthday celebration continues on into the next month! I needed this weekend to get me ready for this week......doc appointments and my second treatment. I think I might have pushed the envelope a little this past week, the energy that had been flowing so sweetly, left sometime last night. But I spent most of the day on the sofa before leaving for Kaye and Jamie's tonight. I am learning, and it is not an easy lesson.....this taking care of myself. I hope we all took ourselves a little less serious today in honor of April Fool's and that we continue to smile and choose to be happy this coming week.